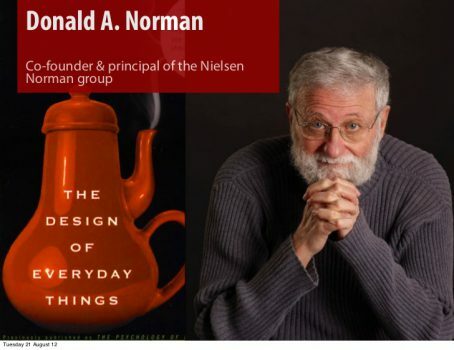 Don Norman’s The Design of Everyday Things did more than introduce me to interaction design. It became the foundation for almost all of my teaching/coaching/consulting. I read the book sometime in the mid-1990s, when my web design career was young. It was written in 1988 and first published as The Psychology of Everyday Things, which made for a nice acronym: PoET. Don writes of learning about the disaster that was the title and its subsequent reprint as TDoET. Although the fundamental design principles of DOET are still as true and as important as when the book was first written, the examples were badly out of date. “What is a slide projector?” students ask. Even if nothing else were to be changed, the examples had to be updated. If you have not picked up a copy of the revised book, run to your favorite retailer ASAP!